That blog title is all about TLA: Three Letter Acronyms. I got reappointed to the Building Performance Institute’s (BPI) Standards Technical Committee (STC)! Woo-Hoo! I’m in for three years of updating national home performance standards, and creating some new ones. 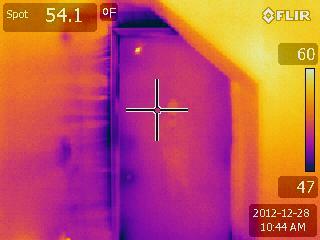 Picture is unrelated: the above thermal image is a great illustration of air sealing opportunities at the door between the living space and the garage. This boundary is especially important to air seal for two reasons: One, the garage is cold, and it makes sense to keep warm air inside and cold air out in the garage. Two, a common cause of carbon monoxide poisoning is from idling cars (I’ll just go back in the house for a minute, oooh Lord of the Rings is on!). Air seal the plane, and you reduce the amount of CO that can enter the house. Still remember to turn off your car, though.